Breakfast is the most important meal of the day. However, we are too busy getting ready for work or school to really take the time to cook breakfast as we should. Hopefully this cookbook will inspire you to cook breakfast often. So good morning and good eating. 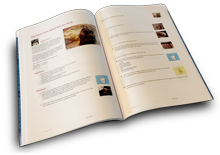 Order a professionally printed, perfect bound cookbook with a full color glossy cover and 49 recipes. Looks like a great cook book but I do not need another!! Sorry but my area for reciepes is bugging and the stuff is falling out on the floor! !